Since our doors opened in 1934, we have dedicated ourselves to customer service and quality products, selling vacuum cleaners Marblehead MA area residents can trust to last. Other vacuum cleaners at area stores may be cheaper, but that's exactly what they are, and they'll end up costing you more in repairs in the long run. We pride ourselves on our long list of repeat customers who continue to shop at North Shore Vacuum and Appliance for the vacuum cleaners and parts they know will endure. Vacuum cleaners aren't always the easiest things to carry. That's why we offer discounts on shipping, for your convenience. In fact, shipping is free for most orders over $59. 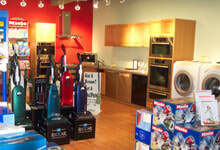 To hear more about our vacuum cleaners, Marblehead MA area residents can call us at the shop at (781) 595-1455.